I must have first seen Dark Star in 1978 or '79, four or five years its original theatrical release. Star Wars (1977), of course, had been a big hit, and probably distributor Jack H. Harris thought Dark Star could attract college-age kids starved for more space swashbuckling, or something. I think I saw it on the campus of the University of Michigan, on a double-bill with Woody Allen's (and Takashi Tsuboshima's and Senkichi Taniguchi's) What's Up, Tiger Lily? (1966). The mostly university student audience found both movies hip and laugh-out-loud funny. Which is why I was surprised to learn that upon its first release in 1974, audiences weren't even quite sure if Dark Star was supposed to be funny, greeting it with crickets-chirping-in-the-distance silence. Considering that one of the major characters is an alien played by a painted beach ball with the hands of the Creature from the Black Lagoon, I'd have thought it was pretty obvious. Prior to his death in 2009, co-creator Dan O'Bannon wrote a text introduction for VCI's DVD version, carried over here, unnecessarily informing the film's audience that yes, it's a joke. Prior to watching VCI's new Blu-ray I'd seen Dark Star only once in the many years since. I was surprised how well I'd remembered it, and a little disappointed to discover that it doesn't hold up to multiple viewings, though it can be enormous fun for those seeing it for the first time. 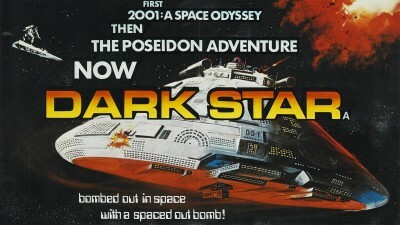 Dark Star helped launch the careers of John Carpenter and Dan O'Bannon, who together wrote the script. Carpenter also produced, directed, and wrote the film's score, while O'Bannon handled the production design, editing, supervised the special effects, and co-starred. They were film students at USC where they somehow scraped together the $55,000 to make it. The 68-minute result, shot on 16mm film, was deemed commercially viable by producer Harris, who had it blown up to 35mm and financed the addition of another 15 minutes in order to bring its running time up to a more acceptable 83 minutes. Harris did this occasionally, buying into and releasing such films as The Blob (1958), Equinox (1970), and Schlock (1973). John Carpenter has described Dark Star as "Waiting for Godot in Space," which is another way of saying nothing much happens, but its uneventfulness is similarly amusing. The scout ship Dark Star, whose mission it is to blow up unstable planets as the vanguard of future colonization, has been all by its lonesome in deep space for 20 years, though its crew has aged hardly at all. Their leader, Commander Powell, died in an electrical accident, but the four others - Lt. Doolittle (Brian Narelle), Boiler (Cal Kuniholm), Talby (Dre Pahich, though dubbed by Carpenter), and Sgt. Pinback (O'Bannon) - seem to be getting along just fine without him. Off-duty, however, the crew has become unspeakably bored. Doolittle dreams of his surfing days in Malibu and creates a musical bottle organ; Talby sits in the ship's dorsal section, gazing endlessly at the universe through an observation dome; Boiler steals a laser gun and does target practice inside the ship. Pinback, meanwhile, struggles with the ship's mascot, a dangerously playful alien shaped like a beach ball. Meanwhile, the spacecraft's computer systems are breaking down, having been so long in space, with one explosion destroying the entire supply of toilet paper. Later, one of the thermosteller bombs begins its countdown while still in the bomb bay area just beneath the ship, refusing to abort. Stanley Kubrick's 2001: A Space Odyssey (1968) was an obvious direct influence, particularly in its depiction of the workaday blandness of long-form space travel, while Doolittle's efforts to convince the talking bomb to abort itself resemble Dave Bowman's (Keir Dullea) similar efforts to reason with computer HAL9000 in Kubrick's film. What Carpenter and O'Bannon achieved for .0055 of the budget of 2001 is darn remarkable. While it's obvious in some shots that the spacesuit's backpacks are Styrofoam packing material, and that some control panel buttons are actually inverted and backlit ice cube trays, the results are among the best ever done with so little money. The film's narrative is slight by design. Besides wanting to pad the running time to what was then a minimally accepted length for a second feature, Harris wanted to make the film more coherent and have something closer to a "story." But Dark Star works best as a non-narrative experience where the viewer just sort of absorbs the quirky atmosphere. Then it can be quite enjoyable. Sourced from a 35mm (blow-up) print, the 1.85:1 widescreen Dark Star looks quite good, considering, and certainly a big improvement over the 16mm print I saw 35 years ago and the various home video versions that have come along since. The region-free disc has better-than-adequate English audio, with 5.1 and 2.0 PCM audio, with optional English and Spanish subtitles (rare for a VCI release). Included is the 83-minute theatrical version only. I understand the 68-minute original cut was made available at some point but is not included here. I hesitate in calling it "too much of a good thing," but here again I'd argue that longer doesn't necessarily mean better. "Let There Be Light: The Odyssey of 'Dark Star'" is an extremely well produced, exhaustive retrospective produced and directed in high-def by Daniel Griffith. It includes interviews with many of the film's cast and crew, including what's billed as O'Bannon's final interview as well as clips from an early student film of his. It's also two hours long, nearly 40 minutes longer than the movie itself. This is not to say that a documentary about a movie can't be longer than the movie it's about, but there's much draggy and extraneous material that really taxes the viewer's patience, even viewers like me who enjoy Dark Star. While a handful of movies warrant this level of intimate examination, I don't see why all that's pertinent couldn't have distilled into a 35-40 minutes of entertaining and informative featurette material, similar to the kind of thing Blue Underground does well all the time. Particularly considering that, in spite of everything, there's still more material spilling out onto other parts of the disc. Also included are a 35-minute interview with novelization writer Alan Dean Foster and a 40-minute one with actor Brian Narelle. There's also a 3D Guide to the Dark Star ship, an audio commentary by "Super Fan" Andrew Gilchrist, and a text-based trivia section. Despite an extremely low budget, Dark Star is pretty funny and intelligent, with production values that, while cheap, still impress. The Blu-ray shows off the film to good advantage, and there are extras galore. Highly Recommended.